Curly leaf kale, asparagus, onion, spinach, green cabbage, miner lettuce, chinese broccoli, rainbow chard, radishes, leek, beet, brussels. Did anyone make the Pad See Ew recipe I linked last week? It was even better than I hoped! More Chinese broccoli this week and you could throw in cabbage and I had a few carrots on hand for color. Oh, and I found the noodles in the refrigerated section on the far right side of Southeast Market 422 E 900 S. It’s a 2 pound pack (instead of 1) so I doubled the sauce recipe. Make the kale into this wild rice gratin for a hearty side or main dish. I’ve made it a few times and it’s a great way to get green leaves in the kids. Beets my two favorite ways: creamy or roasted. For the creamy recipe I like to add dill and you can dice small cubes if you don’t have a mandolin to get those perfect juliennes. For roasted, peel and cut in wedges, toss in olive oil and roast covered until soft and then take the lid off if you want to crisp up a little. Serve at room temperature on a bed of spinach or miner lettuce (or not) with a sprinkling of goat cheese (I prefer creamy chevre), walnuts, and reduced balsamic. I’m kind of a Trader Joe’s fanatic, they have the best price on cheese and balsamic glaze. So if you’re driving by grab chevre and gruyere. Small: cherry tomatoes, yellow summer squash, kale, beets, cucumbers, mint and sesame leaves, arugula, basil, bell pepper, broccoli, miniature romain, green leaf lettuce, persian cucumbers, radishes. Medium Add: pursalane, swss chard, goji berries, spring onions, extra kale, extra green leaf and romain, patty pan squash, 3 varieties of cucumbers, extra radishes, broccolini, bell pepper. For mediums pursalane is new for this season, but a David favorite. Michael Pollan calls it one of the two most nutritious plants on earth. Here is some more information and ideas of what to make with it. Including the bell pepper would be good- the vitamin c will help with iron absorption. The mint I just made into tea, adding raw honey from David once it was cool enough to touch. You could also use it and the sesame leaves in spring rolls or as herbs in fancy drinks. In Korean cooking it’s used as a wrap for grilled meat or mushrooms along with romain. That’s what we did last night. 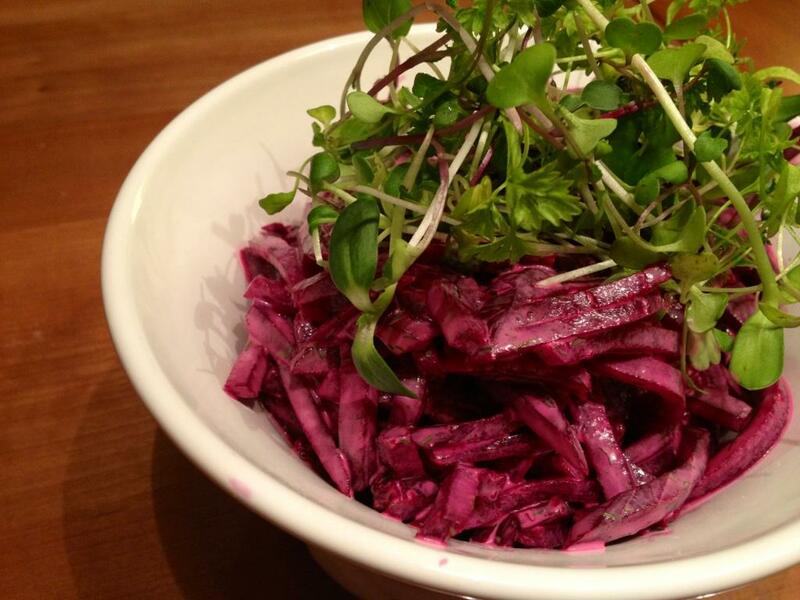 And when we get a good amount of beets I like to make this creamy beet slaw. Parsnips, shallot, garlic, onion, spinach, arugula, mustard greens, miniature romain, broccolini, daikon radish, carrot, brussels sprouts, turnip, beets, purple cabbage. Anyone else excited for beets? I’ll be roasting those right away and putting them on a bed of arugula and sprinkling with chevre and balsamic vinegar. May as well roast the carrots, parsnips, turnips, and brussles on the same baking sheet. Here are some turnip ideas, many of which use other veggies from our box too. I have a hard time with mustard greens, but this simple recipe looks hopeful; vinegar in the mustard can cut the bitterness of the greens. Hello Winter members! Every winter David just offers a small box and forgot, so those of us that normally get a medium got one for the price of a small. The green leaf lettuce is a more tender break from the usual romain. I’m going to let the oven do the work for a meal this week and roast parsnips, brussels, and beets on one baking sheet. Here’s my favorite thing to do with green cabbage again, since blog posts back to March were lost. Here are 3 ideas for black radishes. Small: parsnips, spinach, curly leaf kale, broccolini, green cabbage, yellow onion, shallot, daikon radish, black Spanish radish, watermelon radish, Korean giant Asian Pear, green leaf lettuce, , brussels sprouts, beets, and honey comb. On a tip from the manager of our business side, Helena, I visited a site called Natasha’s Kitchen. She specializes in Ukrainian and Russian cooking. And Russia and our winter CSA shares have something in common — cabbage and beets hold up well in the cold. Here are the highlight recipes (for my tastes) I found on her site. Check them out and enjoy. I think this one could be made with raw beets if you were inclined, or beets that you matchstick and then nuke gently just to take the edge off. Also, top with the microgreens. The sweet and the sharp go well together. The faster of her two borscht recipes. Uses both cabbage AND beets AND onion AND potatoes. I like fermented and pickled things, so this sounds great to me. And while a good sauerkraut is fantastic, I went and found a recipe for Russian pickled cabbage for the adventurous. It does take three days to ferment, but this is faster than making sauerkraut. As I currently have kombucha, ginger beer, and mead all fermenting in my cupboard, I don’t think I’m allowed any more real estate — let us know how it compares if you try it. Given the abundance of turnips, beets, and radishes we receive, and given Mark Bittman’s eloquent defense of them this week as vegetables of the cold season, I will make a lazy effort to pass on a few ideas through his most recent article. I so rarely eat artichokes that aren’t hearts in a jar that I always have to look up what to do with them. So rather than pretend to know what I’m talking about, I’m going to link you all to a very good visual instruction guide! Beets, I know something about. Scrub the beets very well, trim off most of the stems (leave less than an inch), and the little tail if it is bugging you. Wrap them individually in foil. Pop them in the oven at 400 degrees for an hour (small ones) to an hour and a half. Remove, cool, unwrap, and slip the skins right off. They are delicious as is, or dice them up with butter and salt, or put into your favorite recipes. This is the least-stainy way to deal with them, but don’t do any step in the process in a favorite shirt (or on your unspoilt new wooden cutting board). Cherries. I challenge you to not just eat them all. I just needed a C. However, they make a really great combo with the apricots that come into season at the same time. Or make a cherry salsa to top meat or grilled veggies. 1 part diced red onions left to sit with a squeeze of lemon juice to take the edge off, 3 parts pitted and chopped cherries, basil to taste. You can just chop it all and combine, or you can throw it through the food processor. Surprisingly delightful.